Playing Time About 75 Min. The cradle of modern humans, called "Homo sapiens” by scientists, was located in Africa more than 100,000 years ago. The first branches of this family began a journey that spanned thousands of years, eventually leading them to Australia and America. The enormous difficulties of this journey could only be overcome because of Homo sapiens’ unique ability to adapt to its environment. Their highly developed brains and their mastery of crafts enabled them master even the harshest conditions. In this exciting game, you will guide the journey of one of these branches. You must struggle to spread your people over the whole world. In order to expand your branch humanity you must develop certain talents: advances in the preparation of food will allow your people to spread faster and wider, while new hunting techniques can protect them from dangers. And your people will need warm clothes to cross the ice deserts of the north and boats to settle in Australia. 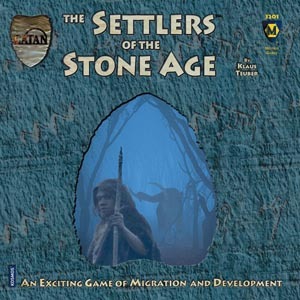 The RDG Team hasn't gotten around to writing a review for Settlers of the Stone Age. YET. We're writing up new reviews all the time. And this one is on the To Do List. But we could really use your help! If you'd like to say a word or two about Settlers of the Stone Age, click here and we'll put it online!